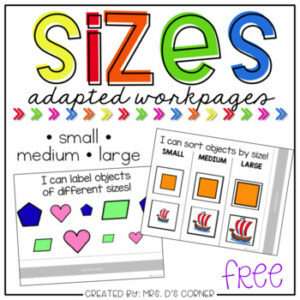 FREE * Functional, differentiated skill work to practice identifying sizes: small, medium, large. How do I use this? How do I put this together? Watch THIS VIDEO to see how to put an adapted work binder together, and get ideas on how to use an adapted work binder in your classroom. FIND MORE ADAPTED WORK BINDERS here.